There is a broad-based tailing off of manufacturing PMIs in Asia in March. For the most part, the drops are not severe. But even where the queue percentile standings are relatively high, it is only because recent manufacturing activity levels in the region have been soft. The 90th percentile queue standings in the region belong to Myanmar at 53.7 and Singapore at 53.0. Note that Japan, at a 53.1 diffusion reading, has a much lower 79th percentile standing. However, Thailand, South Korea and Malaysia show readings below 50, indicating manufacturing contraction in March. Indonesia, at 50.7, is close to contraction despite its 69.8 percentile standing. That standing only tells you that it has been weak for some time since such a weak diffusion reading has such a strong standing. The graphic on top illustrates all this quite plainly as the entire region swooned from late 2014 through 2016 with most countries showing a manufacturing revival in late 2016 or early 2017. And while activity levels in 2018 are clearly superior to those in 2016, as of early 2018 momentum is being lost but the levels of activity are mixed in comparing them to 2017. Still, these levels are strong when compared to 2016 or 2015. The question of growth and momentum is back on the table for Asia. Japan is a good example of this phenomenon. Japan’s Tankan survey is its most venerated economic barometer. The survey looks at manufacturing and nonmanufacturing segments as well as responses by large, medium and small firm reporters. The response from the large firms in the manufacturing sector is the historic barometer for growth from this survey. 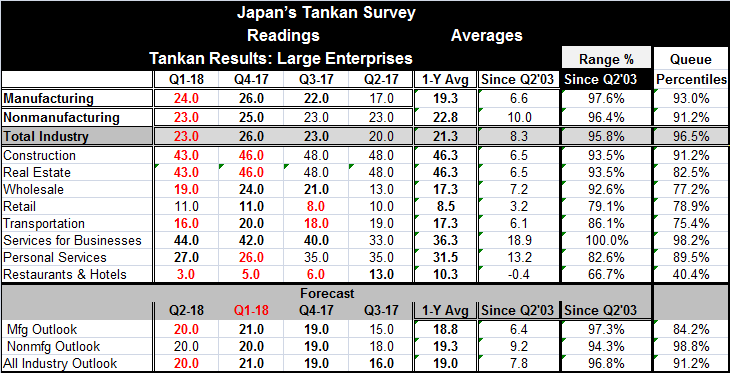 The Tankan reading in Q1 2018 for large manufacturing firms fell back to 24.0 from 26.0 in Q4 2017. The gauge last dropped month-to-month in Q1 2016 marking a two-year period since the Tankan gauge last receded. The outlook gauge for manufacturing for Q2 2018 also took a step-back. It last backtracked in Q2 2016. The tankan overall and manufacturing gauge still have very strong queue percentile standings in their respective 90th percentiles. After rising for two years, the small one-month set back is not taking down the level of activity by very much. At this point, the Tankan set-back is a question of momentum and one about the future, not one about current weakness. Although the Tankan future gauge has only fallen off a bit, it has a percentile standing that is weaker than the current index at an 84th percentile standing. Nonmanufacturing is much stronger with a 98.8 percentile standing on its outlook reading. For medium-size survey respondents in manufacturing, there is also a small step-back in the current trend in Q1 2018 and in the outlook. Small-sized firms in manufacturing show no change in their Q1 2018 assessment and their outlook actually picks up by a tick looking ahead to Q2. Both medium and small firm percentile queue standings are stronger than for their large firm survey counterparts. Japan’s Tankan weakened on a rising yen and on concerns about a looming trade war. These, of course, are features and trends that are now in place and will have some lasting impact. In news today, there is more about the U.S. and China slapping restrictions of one another’s exports. Apparently, we are going to play this game of policy-chicken. Interestingly, on the political front in the U.S., Senator Elizabeth Warren (D-Massachusetts), currently in China, is basically backing the policy being pursued by Donald Trump (R), who is not exactly her political soul mate (here). Warren, who is a champion of consumer rights and focused on domestic fairness issues, is unusually engaged in an international trade issue. The U.S. foray into sticking up for itself on global trade is drawing its battle lines. While there is a groundswell of support for free trade, there is also a growing awareness that trade has been occurring under the rubric of ‘fair trade’ and ‘free trade’ but that the label has been untrue. As U.S. policymakers have looked more clearly at the effects of trade, it has become extremely obvious that the precepts of free trade have not played out through U.S. trade flows. But the drift way from free trade principles had been going on for so long and had become so ingrained that it is now hard to get the rest of the world to understand what fair trade really is and what changes it requires of them. And it is hard to convince them that what had become business as usual will no longer be tolerated. The U.S. has turned to a more confrontational way of making this point by imposing tariffs. But China and the EU are preparing to strike back at the U.S. for its actions and we know where this will lead. I have been a supporter of this confrontational strategy simply because nothing else has worked and because world trade at its base for many countries has been supported by persistently misaligned exchange rates. Many current account surplus countries have persistent surpluses and growing foreign exchange reserves a combination that all but screams structural currency manipulation. Under free trade, for example, a country with a current account surplus will see its currency rise and that will reduce its competitiveness and control its surplus. But if countries take their accumulated excess dollars and, instead of selling them on the open market, invest them back in the dollar region by buying U.S. treasury securities, for example, there will not be any upward pressure on their currency and competiveness will be retained. Exports will stay strong and their surplus will be retained. This will allow it to continue to benefit from export-led growth. Between less than free currency movements and other restrictive practices, the U.S. has been saddled with never ending and huge trade and current account surplus positions. This payments imbalance is going to take a long time to remedy. How destructive this ‘trade war’ becomes depends on how enlightened participants are and how willing they are to come to terms with consequences of their own actions. Will foreigners continue to seek unbridled access to U.S. markets and under terms that are favorable to them, or will they adapt to the real rules of free trade and compete fairly? While the U.S. is the aggressor on the trade war front, that is only because the U.S. has been the victim of trade abuse and no one has been willing to deal with it. So now the U.S. has taken an aggressive posture. Is there risk in this approach? There is. Is it worth the risk? It is. Will things get worse before they get better? They may. That depends on how enlightened the participants are. And this is a tough sell. A number of countries’ entire macroeconomic policy is based on selling exports to generate growth. Recall that China snatched the South China Sea and was told by the world court that it has no legal claim and yet China continues to claim it and envelope into its security proximity. The duality of the meaning of ‘free trade’ can be lost on no one in such an environment.